We live in an on-demand, society. If something we are intrigued by online takes more than a couple of clicks to access, we lose interest. Kids today don’t even understand the concept of commercials or having to wait to watch what they want on television. The learning industry is no different, and it has had to adapt to provide the value that this audience is expecting at their fingertips. Within the learning industry, eLearning is following the trend of instantaneous micro-lessons. First and foremost, what is a micro-lesson? A micro-lesson is an eLearning lesson that can last anywhere from one minute to ten minutes, hence the word “micro.” Micro-lessons prompt instructors to condense learning material into short and concise teachings, rather than a drawn-out lecture. Former president Woodrow Wilson once said, “If I am to speak ten minutes, I need a week for preparation; if fifteen minutes, three days; if half an hour, two days; if an hour, I am ready now.” The key point to his statement is that it takes time to condense a focused lesson into a shorter time frame. You have to be cognizant of the power that the words hold and know exactly what point you are trying to get across. The same goes with eLearning. Knowing that the user only has a few short minutes to learn, the developer must focus intently on the lesson at hand by making it attainable, yet powerful. One of the main differences between teaching someone in a class versus teaching someone online is that in person the teacher is able to expand more about the subject if the learner does not quite understand. With eLearning, the learner does not get that luxury so it is important that the micro-lesson is easy to understand, yet thorough. As mentioned earlier, we live in a very short-attention culture, specifically the newest generations: Millennials and Generation Edge. These are the generations that can’t imagine life without their cell phones, and don’t know what life was like before the internet. 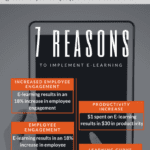 To reach the future work force, provide them with options that incorporate micro-learning. This will allow them the opportunity to learn on their own time, at their own discretion. Several universities are incorporating the online learning approach. The reason why online learning and micro-lessons are so successful is in majority because of the convenience factor. According to Pew Research 92% of Americans own cell phones, 68% of Americans have smartphones; 45% have tablets. By incorporating online learning into the overall training strategy, organizations are able to access learning anytime, anywhere. Micro-lessons can transform the amount of learning that is received and provides value to those who are laser focused on growing and developing. By prioritizing necessary information and cutting the fillers/fluff, micro-lessons are truly proving that sometimes less really is more.